LAST Projects Gallery and Muzeumm are pleased to present Crisis Actors, a group exhibition of bodies in extremis; which examines embodiment, vulnerability, and resistance through figural work. These five artists, counter marginalization, asserting powerful narratives through the appropriation of popular, historical, and sacred forms of representation. Amanda Kirkhuff’s lush, formal oil portraits, replete with stylized domestic tableaus and intensely textured, graphite and ink wash works create a pantheon of heroic, mythologized outlaws. These are women and queers who have endured Homeric odysseys though the legal system, or were offered up as effigies to warn the public against a similar fate. There are depictions of figures from tabloids, Greek mythology and art history enacted by Kirkhuff’s friends. Kirkhuff creates a visual record of feminist and queer bodies utilizing hate, violence and militarism as tools of resistance. Ciriza is an interdisciplinary artist, musician, and birth doula who will be showing film stills from performance works shot between 2012 and 2015, in addition to her hair sculptures. Donning elaborate “skins” of latex and snakeskin, and disfiguring contact lenses, Ciriza plays out primal, ambiguous, narratives rooted in the generative earth. Ciriza draws from her own Afro-Cuban roots and studies of Santería cosmology in her performances. Karl Pétion is a visual artist, musician, and filmmaker based in Los Angeles. Raised in Port au Prince, Haiti Pètion was informed by the folklore of his native country, the music and the rich visual performing art culture of Vodou, In 1983, as a teen Pétion immigrated to NYC. Pétion's mixed media paintings challenge imposed narratives of racial identity, gender, class and beauty with humor and gravity. Pétion has a BFA from the Kansas City Art Institute, and an MFA from CalArts. Julie Weitz is a visual artist based in Los Angeles. Her videos, installations and photographs examine the experience of embodiment in the digital realm. She uses physical props, often cast from her own body parts, and combines "anti-CGI" aesthetics to make work that blurs the boundaries between sensory perception and material reality. Shadow of the Object is a vivid hallucination of the artist’s psychosexual exploration of herself as an object of desire. Shot almost entirely with a GoPro attached to her head and hips, Weitz insinuates the perspective of a lover as she interacts with a headless, limbless sculpture, cast from a mold of her own body. 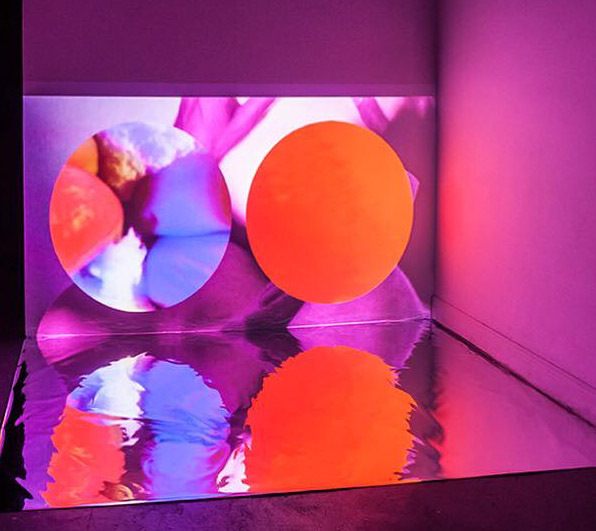 Weitz's immersive video installation Touch Museum premiered at Young Projects in Los Angeles in November 2015 and received critical attention in Artforum, The L.A. Times and on KCRW.